If you want one, please use the online store pre order and deposit. After almost 30 years of dreaming, dozens of prototypes and thousands of hours of experimentation… the ATAX© has arrived! 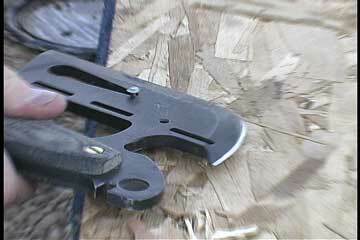 If you have a good pocket knife or multitool and the ATAX… You can do it all. Instructional DVD free with purchase. The Video may be purchased separately and the cost of the video (less S&H) will be deducted from the purchase price when you order. 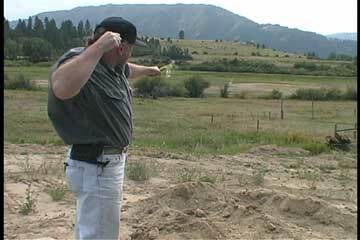 The following photos were taken from the actual ATAX training film. They will give you a basic idea of how this powerful tool is used! 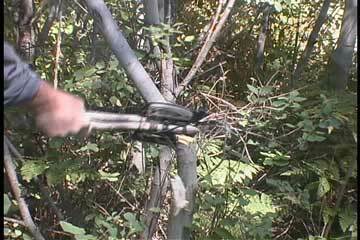 Sling shot rubbers can be attached to the tool so it can be used to launch arrows! 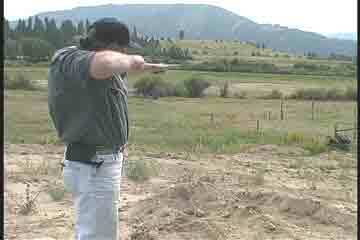 Here Hood draws the arrow launcher. 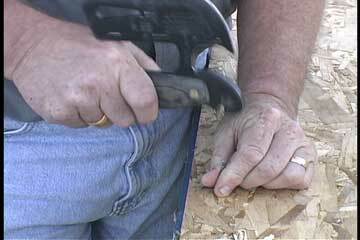 You can just see the arrow leaving the tool. 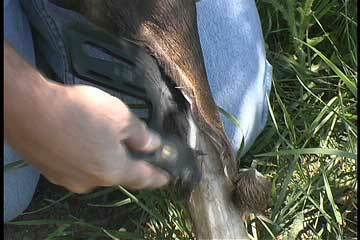 It is great for getting small game and will launch any small shaft accurately enough for hunting. The arrow is barely visible just above the fence post in the distance! You supply your own slingshot rubbers. 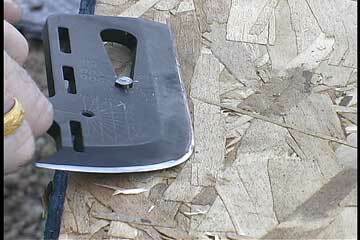 The back of the tool finds use as a hammer and pounds in a nail. What goes in must come out! 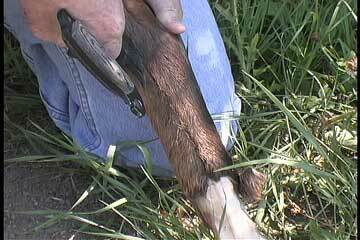 It will also remove nails. 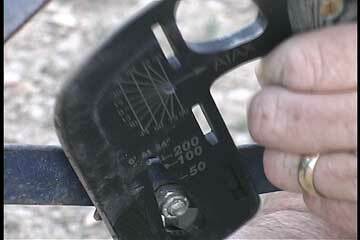 Here you can see the head of the nail in the rangefinder/wrench slot. ZIP! and the nail is out… too fast for the camera to see…. 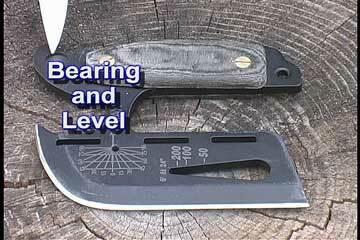 Just sight along the top of the blade and read the angle from the graphic. 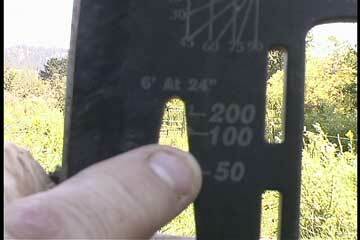 In the video we show you how to estimate the height of a tree or other object with the ATAX. 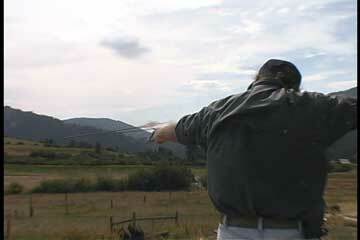 Once you know how to use the inclinometer you will find many other uses for it. below the hammer you will find a wire buster. 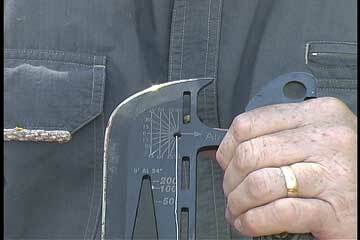 Fence wire, barbwire and more can be bent and busted with this unique tool. You can also use it to grip hot bails on your coffee pot… Save those fingers! 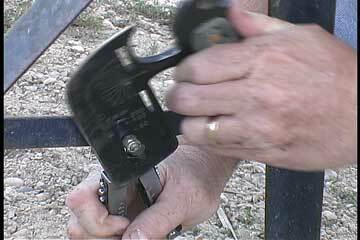 SO you have a multitool… not much good if you want to loosen a screw and it has a nut! Here’s the answer. 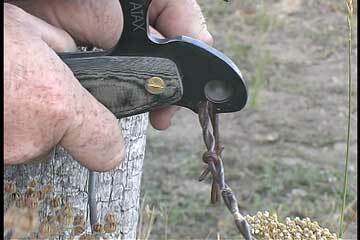 The ATAX can grip the nuts and save you from going nuts! 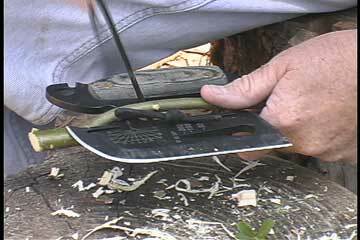 The "ULU" edge on the knife makes a super skinning tool. In fact that was one of the most important features we designed into the tool. One quick swipe and the skin parts so you can get at the goodies. 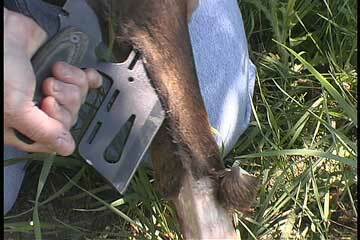 The rounded edge lets you slip into tight places to cut tissue without slicing holes in the skin. It holds an edge like a razor. 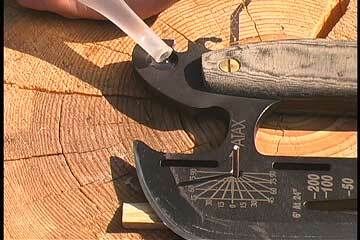 When we were developing this tool, all of the local outfitters begged us to borrow our prototypes. Now they own the real thing. 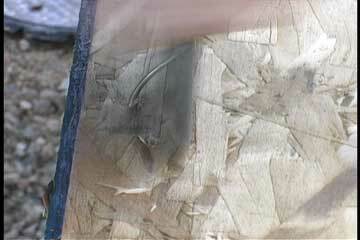 There goes the skin… Just like it had a zipper. The rangefinder is simplicity itself to learn to use. 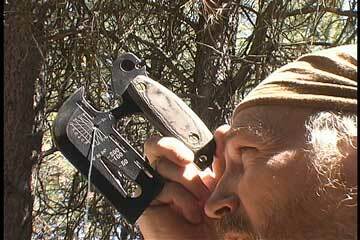 It is plenty accurate for bow hunting and great for hunters. 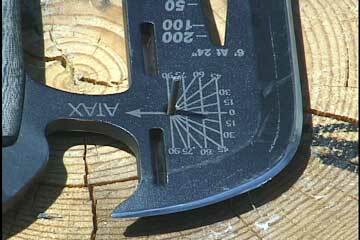 One of the unique features of the tool is the divot used as both a fire bow bearing and a leveler for direction finding. The fire drill fits into the almost frictionless bearing. 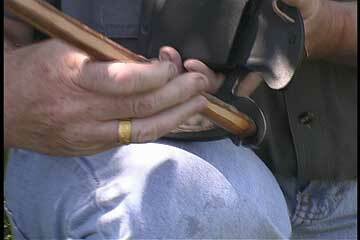 The SHEATHED tool is held against the knee. and the firebow is put to work. 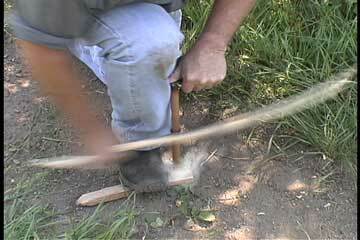 It IS work but it’s great fun to learn this primitive technique. Don’t know how to do it? 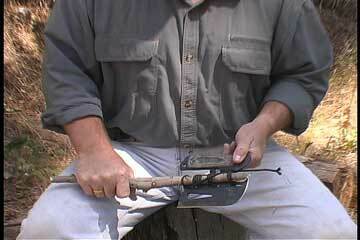 get Volume One of the Woodsmaster series and we show you all of the steps in making and using a Bow drill. 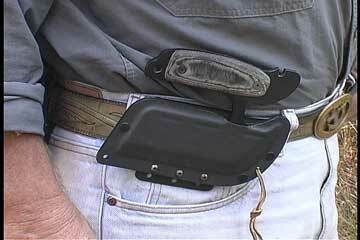 The ATAX hangs easily on your belt and never gets in the way like big choppers can. You can ride horseback, cycles, 4-wheelers or just hike and it never restricts your movement… It’s just a little bigger than the back pocket on your jeans but it chops and cuts like a sword. 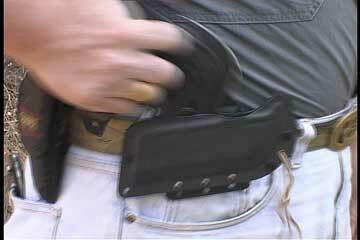 The Heavy duty Kydex sheath is reversible for left or right hand use. 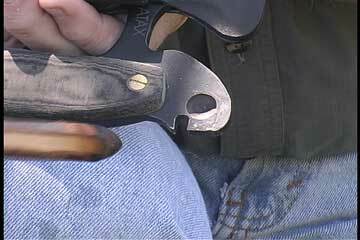 The unusual design of the sheath allows for a "Quick draw" while still keeping the blade secured during periods of heavy activity. 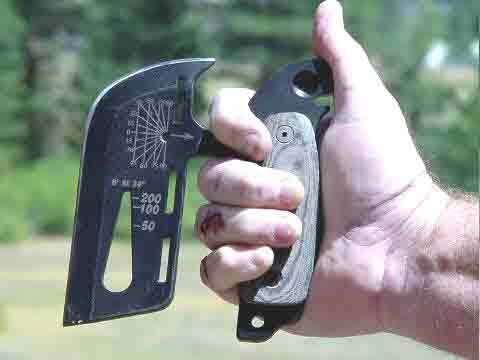 There’s more than one way to hold the ATAX. The handle is a nice starting point but for finer carving and shaving this grip works great too. Each person will find many ways to hold the tool. The video identifies all of the parts of the tool so you know what we are talking about at all times. Here we look at the survival kit. 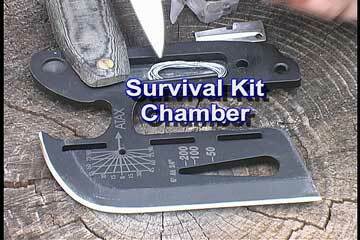 Incidentally, the survival kit chamber in the handle measures 2.25" X .75" X .25" deep. Here you can see the graphic and divot working as a compass/clock. With a twig and a few drops of water you can tell directions and time of day. North is at the bottom of the photo and it is about 4 pm Standard time… That’s just the beginning of what you can do with the graphic! 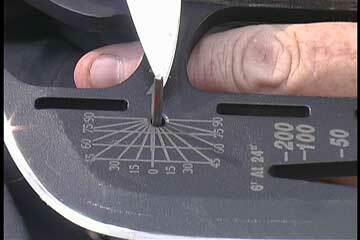 Laser engraving helps you to determine lots of information about your environment. The included video tape instructs you in the use of this unique graphic. It was in the afternoon when this shot was taken. Can you tell how we know that? What time is it? 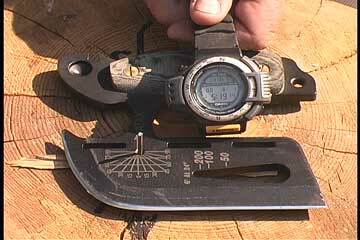 The indicator stick can be any old stick or even a nail you cut for the purpose. Hey! What time is it? in this case you have to remember to add one hour for Daylight Savings time. In the woods… who cares? 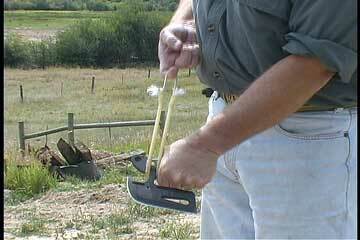 One of the prime uses for the tool is as an AX. That’s what put the AX in ATAX. 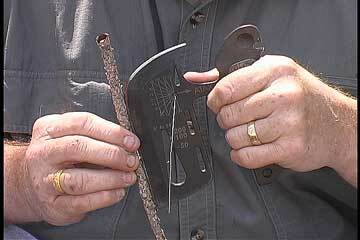 Here we show how to bind the tool to a split stick for use as a chopper. You don’t even need to get fancy. 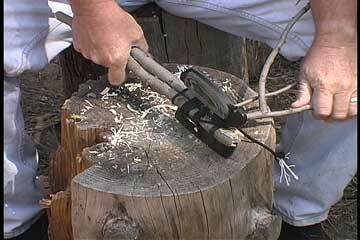 Just a flexible forked limb can make the tool into a functional and reliable chopper. 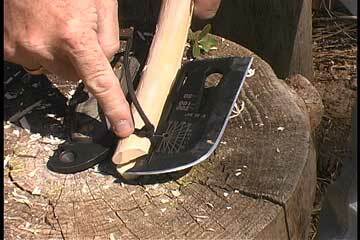 Chopping down branches for shelter or other uses is a cinch with the ATAX AX. Yep… One FINE tool. You’ll be seeing much more of this tool in the future. But why wait to SEE it… Buy one while we have some in stock! 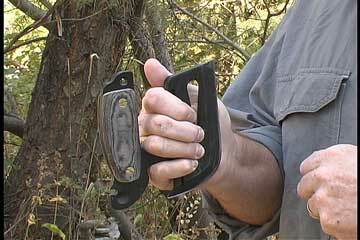 The ATAX has some clear practical applications as a tactical self defense tool. We will be covering these in the future. Several military units as well as advanced martial artists are developing tactical information relating to this tool. For our purposes however… If you can "Flail" with your arms… imagine what would happen to the sorry sucker that tries to attack you if you have one of these on hand…. End of story. We only had 100 of these made initially and we sold out almost immediately. We then sold the next batch of 100 in record time. If you would like one of these tools, please notify us so we can reserve one in your name now. 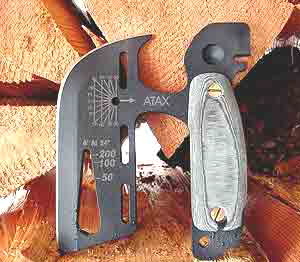 Hoods Woods is now taking orders for ATAX Tools. There is only a limited supply available so it’s first come first served. Click on the below link to read more about the tool and it’s availability and cost.